1,756 km of cycling - as part of a bicycle world trip - across Satun Province in southeastern Thailand via Ko Tarutao und Ko Adang to Ko Lanta and Ko Phi Phi, via Railey to Ao Phang Nga National Park, further north, with daytrip detour to Myanmar, then to Ko Tao and via Bangkok and Ayuthaya to the Cambodian border. 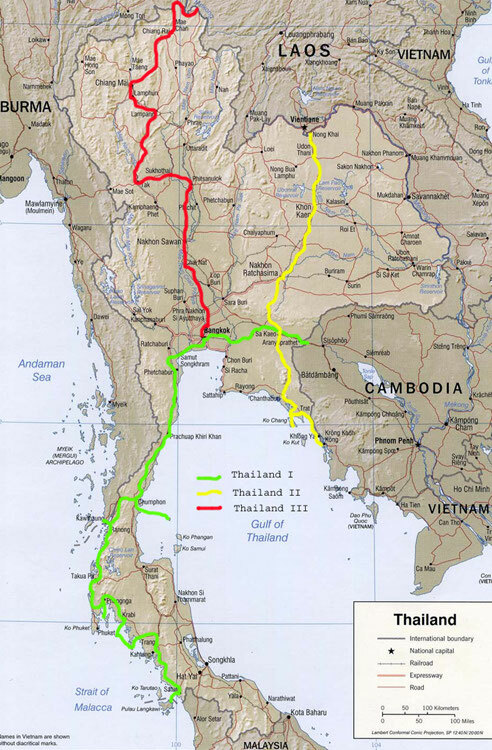 Do you like Cycling Thailand I? After a few relaxing beach days on Pulau Langkawi Island and some cold beers (Duty Free Zone! ), Steffi and I turned our backs on Malaysia in late October and boarded the boat for Satun, the southwestern province of Thailand. We knew well that the west coast of Thailand from south to north to Phuket would become more and more touristy, crowded and expensive. So I was particularly happy when I found out that the barely known group of islands of Ko Tarutao National Park in the south of Thailand was already reachable by boat, although the National Park actually did not open until mid-November. So we were on the completely undeveloped island Ko Adang with two Swedes and the only guests! The park rangers even cooked for us and we were able to set up my tent right on the beach with sea view. We spent four days on the Robinson Island with snorkeling, diving, jungle trekking and lounging before we took the boat back to the mainland with a heavy heart. The next day we went by ferry to the world famous island Ko Phi Phi. While on Ko Lanta the damage of the tsunami of December 2004 was still limited and we had barely seen any of it, the palm stretches of bungalows and hotels of Ko Phi Phi Don had been razed to the ground. As Thailand's second most affected area, there was simply nothing left of the simple accommodations, and only a few of the large blocks of hotels had their refurbishment completed. So only a few isolated palms stood on a large empty area and where one only looked or listened, everywhere was built. This and expensive remaining accommodations did not stop us from taking a day trip on a small longtail boat to the uninhabited neighboring island of Ko Phi Phi Leh. If you are looking for paradise, you will find it right here! Unfortunately, we were not the only ones who noticed this and since the movie "The Beach" with Leonardo Di Caprio, who was shot in the breathtakingly beautiful Maya Bay, you are always in company. And yet, no question, with this dreamland, steep cliffs, crystal clear water and narrow steep fjord with deep turquoise water, this is the hitherto unbelievably most beautiful patch of earth on this trip, if you can say anything like that at all. After two expensive nights we took the boat further north to Ao Nang, from where we drove the next day with a small longtail boat to Railey, the world famous mecca of the Freeclimber. There I climbed on ropes on partly overhanging walls into a deep lagoon surrounded on all sides by high cliffs and explored with dark headlamps huge huge cave systems, which partly led uphill through an entire massif and ended in the middle of a famous bigwall cliff and thus breathtaking views on bays and climbers offered. We bathed in the crystal-clear turquoise water and swam too steeply out of the sea outstanding rock formations. The next day we continued through impressive rock landscapes north to Phang-Nga, where we bought tickets for our last touristic sightseeing tour. The longtail boat the following day we drove through the famous steep rocky islands of the Ao Phang Nga National Park, took a break at the floating Muslim village Koh Panyee, which was built almost entirely on stilts in the sea, and followed in the footsteps of James Bond and countless other tourists a detour to the famous "James Bond Rock", which is known from the movie "The man with the golden gun": the highlight of this one hundredth day of travel! We left Phuket with the biggest tourist bustle in Thailand at all and turned off to the north-south road no. 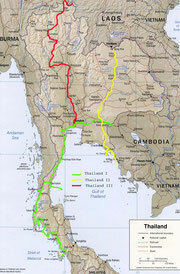 4, "only" still 850 km to Bangkok. So it went past the sad remains of Khao Lak, the hardest hit by the tsunami region of Thailand. The police boat, from which the pictures were taken around the world in December last year, was still lying on the edge of the forest, several kilometers from the coast! We could not find the place where we wanted to stay overnight, it simply did not exist anymore! After 200 km on the west coast to the north we stayed overnight in Ranong, from where we drove the next morning with a small longtail boat to Kawthoung, the southernmost place on the mainland of Myanmar. In addition to renewing our 30-day visa for Thailand, we had promised an interesting day in Myanmar, but we were just waiting for a port like any other in Southeast Asia. The trip on the road to the north was forbidden for foreigners, there was nothing to see in town and so we drove back to Thailand at noon. The next day we cycled further northeast to Chumphon on the east coast, returning to the South China Sea that we left on Malaysia's east coast exactly 30 days ago. Every full moon in November, Loi Krathong is celebrated in Thailand. Surrounded by music, competitions and many performances in the evening, floating, artistically arranged arrangements of flowers and banana leaves with burning candles on rivers, lakes and canals of Thailand are sent by every Buddhist on the journey. So this liberates himself from all evil and evil, which is now carried away on the water with his arrangement of him. We were fortunate to be able to observe this tradition at Chumphon on a festival site before taking the midnight boat to Ko Tao Island in the Samui Archipelago. Unfortunately, we had the world's largest beach party, the Fullmoon party on Ko Phan Ngan for a day missed. But the psychedelic trance party, which has for a long time been unique, has meanwhile become a party with six areas with all sorts of music styles, from trance through hip-hop to normal pop music. It did not hurt us so much to have missed this completely overcrowded mega-party. Still, we had planned to continue from Ko Tao to Ko Phan Ngan, but the monsoon held the entire Gulf of Thailand firmly under his belt. And after two days of almost continuous rain, we canceled this plan and took the night ferry back to Chumphon, even though we had a small bungalow 60 feet above the sea on a bluff with a breathtaking view from the balcony. Still, a wise decision, because this was actually the only boat that was still expiring, all the others remained in the harbor due to storm and high waves. Here we spent five extremely stressful days with sightseeing, excursions, visa formalities and endless running. So we visited the glittering temples of Bangkok, such as u.a. the completely overcrowded but very impressive Wat Phra Kaew, the Grand Palace, Wat Mahathat and Wat Pho. We made a trip to Ayuthaya north of Bangkok, the Thai royal capital from 1350 to 1767. Declared a Unesco World Heritage Site, the ruins of Ayuthaya's historic temples were scattered throughout the city. Already gigantic and impressive, but painful for our feet. The formalities for the visas for China and Laos were comparatively uncomplicated, but they were even more expensive! 30 days Laos and 90 days China we had both in our pockets, but the next morning we went east, finally back on the bike. Cambodia was waiting!